This app can send to all your social networks and blogs with one post. You select what to post to including Facebook, Twitter, Blogger, Wordpress, Flickr, Tumblr, Posterous, and more. This is the only children's app you might need with over 5 games, lot's of Video, and Music! Contract Kit is a comprehensive collection of over 600 Business contracts and Business letters. This is the perfect app for the Professional Car Salesman to boost your car sales, keep relationships with your clients, track your commissions, and keep up with the latest car news and reviews! A must for Insurance Sales Professionals. Track leads and clients, get instant quotes, commission tracking, recorder, and more! Improve your marriage! Tracks issues, marriage tips and more! After the Joplin, Missouri Tornado hit and nearly wiped out the city we knew an app like this was needed. It’s ahead of the rest since it lets you record video and upload it offsite. So, if you lose your phone (or a tornado hits), you'll still have a video record of all you own in your home or business. 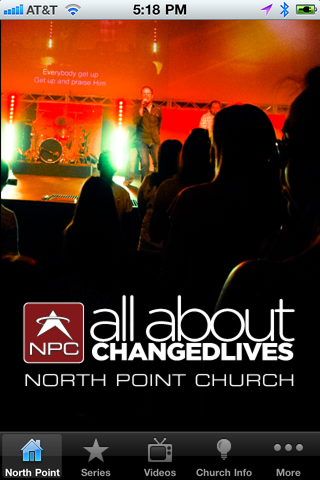 The North Point Church (NPC) iPhone App offers information about North Point Church’s service times, videos, the current series we are in, upcoming campus events, previous weekend talk podcasts, directions to NPC’s campus and much more! This App will let you to stay current on what’s happening at NPC and give you a very relevant way to share NPC with others!